The project l’m Humanity is based on the concept of “post-humanity music” and explores how new music will be transmitted, recorded, mutated, and diffused whether sung or played via word of mouth, as scores, through radio, records and CDs, or cloud computing. Music travels through space and time, undergoing mutations on its way. The close connection between music and media is like that between transmission and recording, and can be thought of as genes and DNA. As a musician, Yakushimaru has worked in a variety of genres from pop to experimental music and has created various types of artwork such as drawings, installations, pieces that make use of satellite and biometric data, a song-generating robot, original instruments, and more. In l’m Humanity, Yakushimaru makes pop music with the use of the nucleic acid sequence of Synechococcus, which is a type of cyanobacteria. The musical information is converted into a genetic code, which was used to create a long DNA sequence comprising three connected nucleic acid sequences. The DNA was artificially composited and incorporated into the chromosomes of the microorganism. This genetically-modified microorganism with music in its DNA is able to continuously self-replicate. So even if humanity as we know it becomes extinct, it will live on, waiting for the music within it to be decoded and played by the species that replaces humanity. When thinking about the lifespan of recording media, for example, CDs are said to last for decades and acid-free paper is said to last for centuries. In comparison, DNA’s lifespan as a recording media is 500 thousand years, physicochemically speaking. Because the lifespan of DNA is so long, it has great potential as a recording media. The genetic code was artificially synthesized by a DNA synthesizer and inserted in a vector, designated pSyn_1. The inserted DNA fragment encoded music chords was introduced to a genome of a host cell (a cyanobacterium, Synechococcus elongatus PCC 7942) by homologous recombination. The music chords in the Synechococcus genome can be infinitely reproduced along with cell division. On the other hand, it is not rare for nucleic acid sequences to mutate, and naturally this leads to changes in the genetic information. In that respect, in the history of “diffusion of music,” in which “mutation” has also had an important role in addition to “transmission” of information, the uniqueness of the “mutation” of nucleic acid sequences was strikingly similar. In the lyrics of I’m Humanity, the microorganism I’m Humanity sings “Stop the evolution―don’t stop it.” Although mutation spurs evolution, it also means the changing of a species. Perhaps I’m Humanity is caught between its own evolution and its fear that its evolving could mean the loss of nucleic acid sequences with musical information, which would make it impossible for I’m Humanity to sing the song anymore. I’m Humanity became the first song in human history to be released in the three formats of “digital music distribution,” “CD,” and “genetically-modified microorganism.” This song, produced with the use of biotechnology, was distributed as pop music and also made it on the Apple Music start page. *Apple Music is a trademark of Apple Inc., registered in the U.S. and other countries. Etsuko Yakushimaru (JP) is an artist, musician, producer, lyricist, composer, arranger, and vocalist. Broadly active, from pop music to experimental music and art. Consistently independent in her wide-ranging activities, which also include drawing, installation art, media art, poetry and other literature, and recitation. Producing numerous projects and artists, including her band, Soutaiseiriron. While appearing in the music charts with many hit songs, she has also created a project that involved the use of satellite, biological data and biotechnology, a song-generating robot powered by artificial intelligence and her own voice, an independently-developed VR system, and original electronic musical instruments. Major recent activities include exhibitions at Mari Art Museum, Toyota Municipal Museum of Art, KENPOKU ART 2016, and Yamaguchi Center for Arts and Media [YCAM]. Her Tensei Jingle and Flying Tentacles albums, both released in 2016, received praise from figures including Ryuichi Sakamoto, Jeff Mills, Fennesz, Penguin Cafe, Kiyoshi Kurosawa and Toh EnJoe. Etsuko Yakushimaru is an example of a new generation of young artists who seamlessly traverse the worlds of fine art, pop culture, performance, science, and technology. Her creative expression includes drawing, installation art, media art, poetry and recitation, including doing vocals and illustrations for a rock band formed in 2006 Soutaiseiriron (Theory of Relativity). She is also a primary member of electronic pop unit Tutu Helvetica, and collaborates with a number of highly regarded musicians. I’m Humanity, is a song by Yakushimaru with which she imagines new ways that music could be transmitted, recorded, mutated, and diffused. Here we have pop music composed with the use of the nucleic acid sequence of Synechococcus, a type of cyanobacteria that has long existed in Ibaraki Prefecture. The artist envisions that even if humanity goes extinct in the future, the species that replace humanity will eventually decode the music in the microorganism through translation methods that go far beyond what we can even imagine. Professor Satoshi Hanada at the Tokyo Metropolitan University opened his lab to enable the process by cultivating genetically modified microorganisms. The genetic codes (276 nucleotides) were artificially synthesized by a DNA synthesizer and inserted in a vector, designated pSyn_1. The inserted DNA fragment encoded music chords were then introduced to a genome of a host cell (cyanobacterium, Synechococcus elongatus PCC 7942) by homologous recombination. Thus the music chords in the Synechococcus genome can be infinitely reproduced along with cell division and are continually passed on from us to the post-human with occasional mutation. 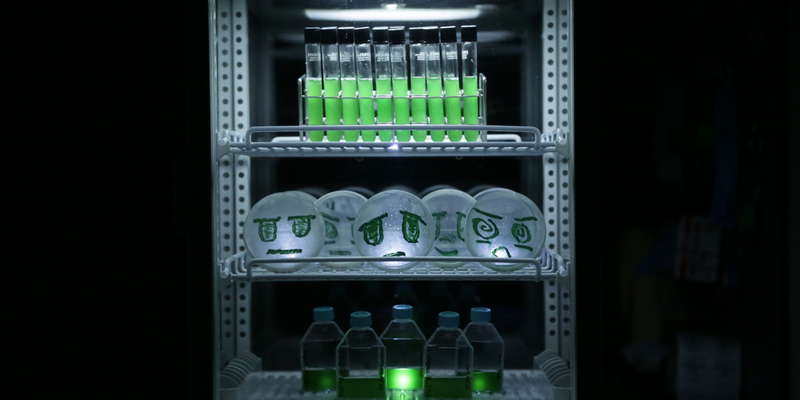 Since recent developments in biotechnology, artists have been fascinated with genetic modification and we have seen multiple examples of work that utilize algae in petri dishes or work with genetic modification in some form. Indeed, an entire field of BioArt has emerged and the jury understands that even if encoding music with a DNA sequence has been experimented with by artists such as the band OK Go working with biochemist Dr. Sri Kosuri or Charlotte Jarvis working with scientist Sr. Nick Goldman, Yakushimaru makes an important breakthrough by introducing this technique to a large pop audience. Further, she made a concerted effort to work with scientists in major institutions such as the National Institute of Technology and Evaluation (NITE) and Tokyo Metropolitan University. Thus, the idea of working with genes as a medium is taken beyond the DIY labs and the fringes of experimental audiences into established institutions of pop culture and scientific institutions. This is a testament to the ability of a singular artist to create bridges, to cross disciplinary boundaries and to enable new ways of perceiving the influence of scientific research on daily life. It is the hope of the jury that by bringing this idea to large audiences, the emerging field of bioart will gain more acceptance and more artists and scientists will collaborate on visionary projects that may take unusual paths and thus potentially bring groundbreaking innovations in both arts and the sciences.